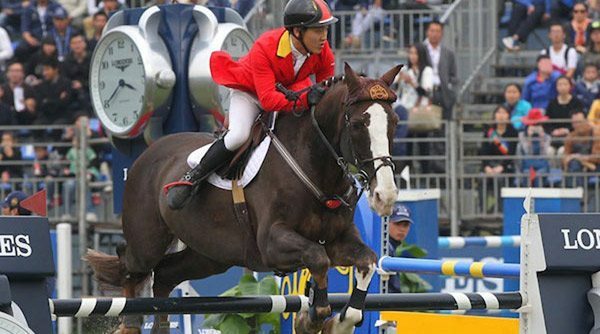 China’s Daniel Zhao and Bolero at the FEI World Cup qualifier at Chaoyang Park in Beijing in 2015. China has the world’s second largest horse population, and now equestrian sport in the country is aiming for big things following a new partnership led by the FEI. Horse sport’s world governing body has entered into a five-year deal with China National Sports International (CNSI), a sports and entertainment company that specialises in equestrian sports in China. CNSI will now be the FEI’s Official Business Partner in China, with the two entities developing a large-scale e-sport, e-commerce and social media presence for equestrian sport to launch in 2018. The FEI’s decision to focus efforts in China comes on the back of rapidly growing enthusiasm for equestrian sport in the world’s second largest economy, which also boasts the world’s second biggest horse population. Against a national strategy spearheaded by China’s General Administration of Sport to increase sport participation, experts are now predicting that the horse sport industry – which already has an economic impact of over 1.5 billion USD in China – is set for huge growth. Currently, there are 400,000 active equestrians in China with one in 1000 fans riding regularly, and 300,000 people directly employed in horse sport. The burgeoning sports industry in China, according to a report from Bank of China International earlier this year, was worth 1.5 trillion yuan ($US222 billion) in 2016, is on track to double by 2020 and could reach 5 trillion yuan by 2025. “Equestrian sport interest is growing rapidly in China,” said FEI President Ingmar De Vos. China National Sports International board chairman Zhang Baosheng said the size of the sports landscape in China represents a huge opportunity for growth for the FEI and for sponsors of equestrian sport. “The key to the success of our alliance with the FEI will be our content offering to Chinese sports fans, and by working with the world governing body for equestrian sport we will be able to offer sports fans exciting and sophisticated equestrian content – this will drive even deeper interest in equestrian sport,” Zhang Baosheng said. It’s too bad that China is killing donkeys all over the world for a “medicine” they call ejiao. Their survival as a species is on the line. FEI should know this, and it should be a deal-breaker.